One entertaining aspect of researching for the exhibition Uncorked! Wine, Objects & Tradition was the discovery of some wonderful period quotes. For example, let’s take the subject of posset pots. You’ve never heard of posset? Well, that’s not surprising, since this drink went out of fashion over two centuries ago. 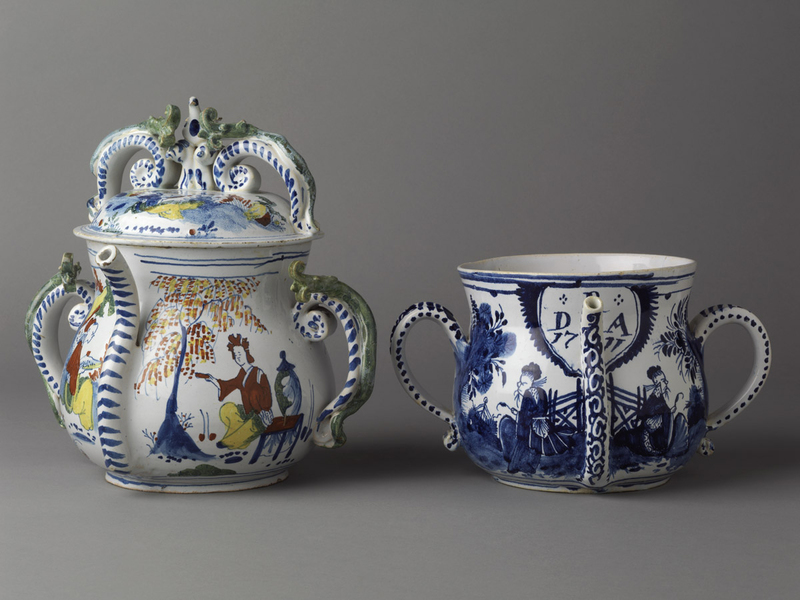 A posset pot – the only stylish way to drink your posset! 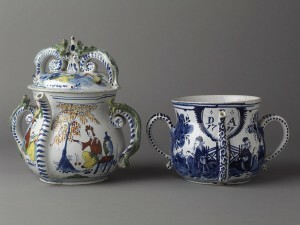 These posset pots illustrate the straw-like spout necessary for sucking up the liquor from the bottom of the pot. Specialized drinking vessels called “posset pots” were made in silver and other metalwork and nearly all types of ceramics. They featured large bellies, lids and, typically, two opposing handles. 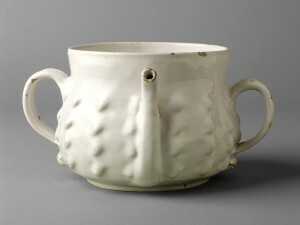 The straw-like spout at the front was used not for pouring but for sucking out the liquor before handing the pot over to ones neighbor for a drink. (Remember! This was “before germs!”) The curds were eaten with a spoon. And fall on fiercely like a starved dragoon. 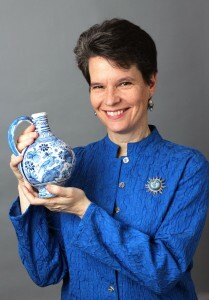 Leslie B. Grigsby joined the Winterthur staff in 1999 and is responsible for the museum’s 22,000 ceramic and glass objects. Since joining Winterthur, she has worked intensively on displays in the 175 house rooms and the Ceramics & Glass Gallery. 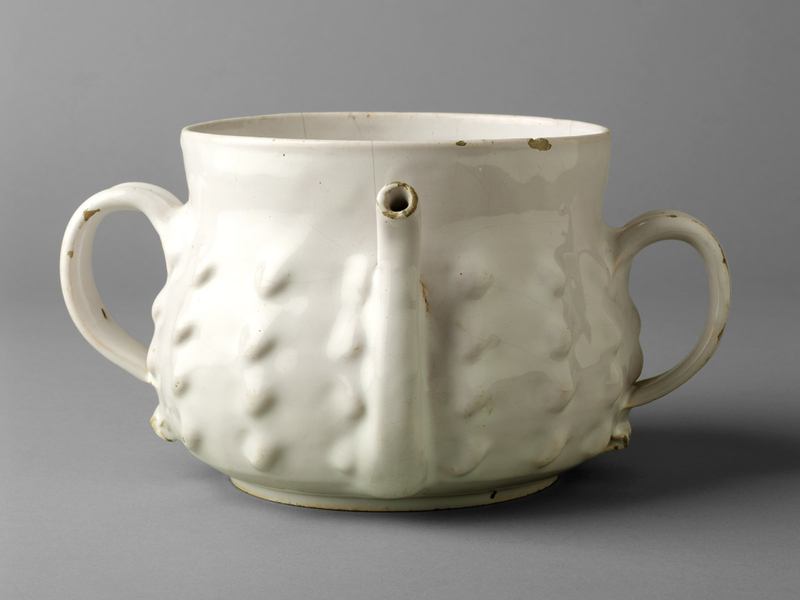 She has hosted and curated several exhibitions focusing on ceramics and glass as well as objects and traditions associated with alcoholic beverages, tea, and coffee. Her most recent work, of course, has been towards Winterthur’s current major exhibition, Uncorked! Wine, Objects & Tradition. This entry was posted in Ceramics, Decorative Arts, Exhibitions and tagged alcohol, collection, drinking, objects, uncorked!, wine. Bookmark the permalink. You’ve never heard of posset? Well, that’s not surprising, since this drink went out of fashion over two centuries ago. Not so. Posset makes several appearances in John Masefield’s The Box of Delights, written in 1935 and set, I believe, in about 1919.
with its quality, variety, diversity, and with your and your compatriots’ scholarship. I’m so glad we got to see it. It was superb, indeed, in so many ways. That will teach us NEVER to miss a major Winterthur exhibit. Many thanks.